For years Mark Bittman has been teaching everyday Americans how to cook. I was a smidge concerned when he wrote that the Minimalist column was ending. But given his recent book Food Matters (which I highlighted in a previous post), I wasn’t too worried. Last week he wrote A Food Manifesto for the Future in the New York Times. He covers everything I believe is important to our pursuit of healthier eating as individuals and as a population. I certainly could not have conveyed it any better. Please read every word. I can’t wait to see what he’ll say next. And my favorite quote from an article on cleaning up Chesapeake Bay pollution. “…it is unfair to expect New York to dedicate taxpayer dollars, staff, and other…resources to reduce [pollution] to the bay when New York reaps no benefit from the bay.” It’s hard to tell in written form, but do I detect major whining? Is it unfair that we get to eat food from places we don’t live? Not to paint New York in negativity only, Governer Paterson of NY is passing an executive order to increase the amount of local food the state purchases. “…where feasible and without increased cost or burden, state-supported institutions must increase the proportion of their total food purchases composed of locally grown food.” Cost is the driving factor in so many decisions. I can’t help but wonder if they spent more on local food even when there was a slight increase in cost, they might find that they save money in other areas. And what about all the benefits that can’t be listed on a balance sheet? Still, it’s a great step forward. To combat childhood obesity, San Francisco has effectively banned the Happy Meal. The city’s Board unanimously passed the “Healthy Foods Initiative Ordinance,” placing nutritional requirements on meals that come with toys. Since “San Franciscans consumer over one-third of their food…at fast food and pizza restaurants,” this would likely have a significant positive impact if: 1) people that were buying Happy Meals continue to do so, and 2) the imposed guidelines actually translate into healthier food. Having spent a year in the Bay area, I confess I was tempted to consume all my meals at restaurants, but nary a McDonald’s meal entered my mind. Haven’t corporations become adept at finding a way around rules? Perhaps parents will now buy two Happy Meals for their children because of the calorie cap? And customers must now salt their own fries? Critics claim that it should be up to the parents to guide their children’s food choices. An occasional fast food meal (toy or no toy) does not negate a healthy diet. At the same time, consumers are constantly bombarded with advertising convincing children and their parents to choose fast food. Nourishing Thoughts has a post about the inherent flaw of having companies self-police their advertising. It’s also a great resource for raising healthy kids. Remember that old Schoolhouse Rock video about bills becoming laws? Two bills were passed recently that will likely mean progess for the health of our food system and children. On December 2nd, the House passed the Child Nutrition Reauthorization bill. The $4.5 billion budget allocates $40 million for a new Farm to School program. Read the National Sustainable Agriculture Coalition’s article about the bill. Interestingly, the bill passed unanimously in the Senate, but only passed 264 to 157 in the House. A highly anticipated and debated bill was passed by the Senate on November 30th, the Food Safety Modernization Act. Eric Schlosser and Michael Pollan advocated for the bill in a New York Times article. So often I have wondered why the government has not seemed to care about the many problems with our food system. I am encouraged that we are actually on the road to progress. True Food: 8 Simple steps to a Healthier You by Bond, Breyer and Gordon is a one stop guide for conscientious consumers. By purchasing organic, we are preventing other crops from contamination. Another thought-provoking point is that “[m]ost agricultural plant breeding programs in the United States emphasize yield, uniformity, market acceptability, pest resistance, and transportability – not nutritional quality. In fact, breeding plants for the characteristics desirable for industrial production and marketing often lowers the plants’ nutritional values.” When we are shopping in the produce section, we are usually looking for health, and have not taken any of the seller’s requirements into consideration. By choosing most conventionally grown produce, our choices have already been narrowed to inferior products. The desire for nutritional superiority, as well as the markedly smaller chance of contamination are compelling reasons to shop at stores that carry local produce from small farmers. Lest we give local the overriding high road, the book excerpts an article by Dan Barber from the New York Times. “The five-acre monoculture of tomato plants next door might be local, but it’s really no different from the 200-acre one across the country: Both have sacrificed the ecological insurance that comes with biodiversity.” The book recommends Seed Savers Exchange (which I mentioned in an earlier post) and Bountiful Gardens as sources for heirloom seeds, in addition to instruction on saving your own seeds. 1. Place pumpkin seeds, cheese or cashews, and garlic in a food processor with the metal blade. Process until mixture is ground, about 30 seconds. 2. 2. Add herbs and lemon juice. Pulse, and slowly add olive oil until the mixture is finely chopped and olive oil is just blended in. Taste and season. When you get a chance to read this book, I’d love to know what you gained from it. For those of you who can’t wait, there’s a trailer on Amazon for it, or this article by Annie Bond. I also found this informative, though unrelated, True Food site. Smart Choices – for terrible terrible people? “Eileen T. Kennedy, president of the Smart Choices board and the dean of the Friedman School of Nutrition Science and Policy at Tufts University, said the program’s criteria were based on government dietary guidelines and widely accepted nutritional standards. Kennedy claimed that “Froot Loops was better than other things parents could choose for their children. So, if you want to pick a “less-bad” choice, look for the Smart Choices label. If you want healthy food – avoid the label. Should we judge foods based on nutrients that are not inherently in the food? The ‘merits’ of Froot Loops do not come from the food ingredients used to make the cereal, but rather the sludge of added vitamins and minerals. Might it make sense to get our B vitamins and iron from actual foods? Richard Kahn, Ph.D, a panel participant… said the guidelines were designed to help people who are currently making “terrible, terrible choices” with their diets. Kahn, who was formerly the chief scientific and medical officer for the American Diabetic Association, said it seemed unrealistic to point consumers toward less-processed foods like fruits and vegetables because the intended audience of the Smart Choices program comprises those who might be choosing between a sugary cereal and a doughnut. Perhaps the label should come with a footnote saying, “intended for people who make terrible, terrible food choices.” Then we would know if we would benefit from the label or not. I think the main problem is this was funded by food companies. Am I the only one who would find the justification for ‘smart choices’ comical, if it weren’t for the fact that people looking for guidance would actually be swayed by this nonsense? It appears that the program has been ‘voluntarily halted.’ But if I saw a product with the logo on it, I would take it as a good bet that the item is a junk choice. 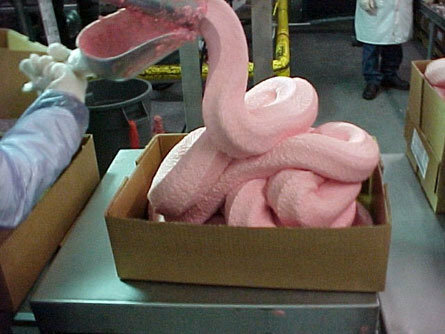 Ever wondered what mechanically separated chicken is? I naively thought it was: chicken, separated by a machine (picture a juicy glistening roasted chicken, with robot arms skillfully picking the meat off the bone). Obviously my innocent brain could not be farther from the truth. If someone were to identify the picture below, I would expect answers like: strawberry soft serve ice cream, or salt water taffy. Maybe even a foam noodle before it’s been hardened. Perhaps a burger and fries would be the better choice next time you’re stuck on the road? 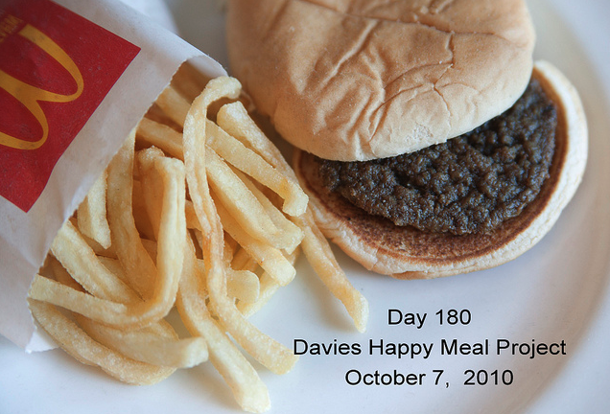 Sally Davies has been taking pictures of a McDonald’s Happy Meal sitting on her counter for six months. The beef and bread have yet to grow mold! Somehow I don’t think whatever is in a Happy Meal is the way to preserve our health – or happiness. If knowing about the conditions that these animals were raised in wasn’t enough to sway me, thanks to these photos I’ve been forever cured from fast food. Now I just need to convince the rest of the family. Sometimes I get overwhelmed by all the topics I want to write about on this blog — which means I put it off and put it off. It’s similar to making positive changes in our lifestyle. Too many good choices can be the enemy of action. So, I will try to take baby steps and start sharing my thoughts with you on a regular basis again, as I also encourage you to find one baby step you could implement today. In any case, thanks for tuning back in. I’ll write more soon.